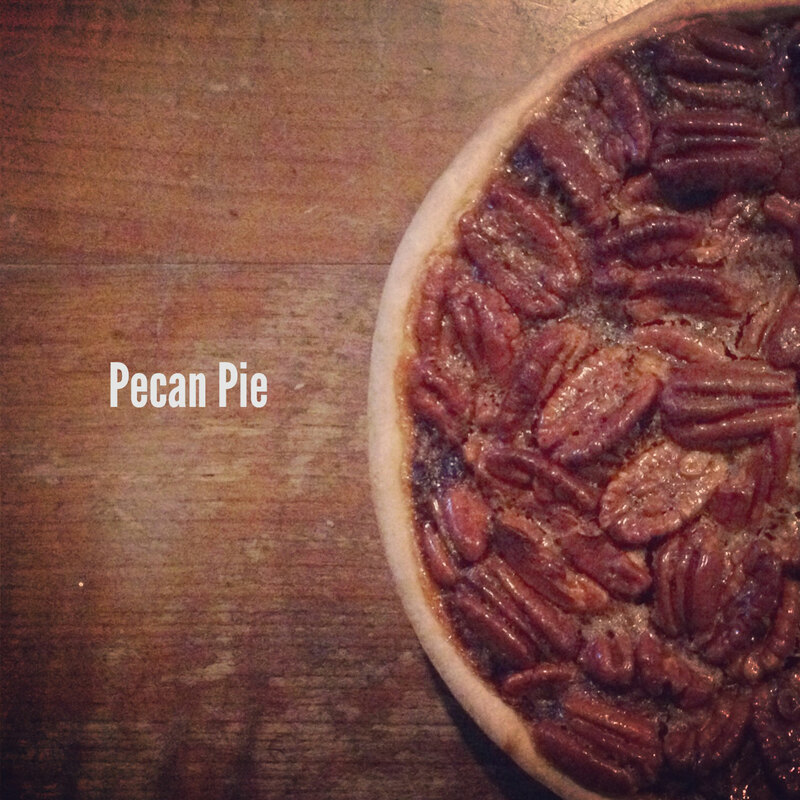 I was the only one in my family who never made a pecan pie. It was always dad’s specialty. He would make the filling and my mother would make the pie crust. (By the way, my mother is a master pie crust maker and I hope to one day come close to being half as good.) I was finally motivated to try this pie myself only after trying a truly terrible pecan pie at a local popular pie shop. I was so offended by it’s taste, that I immediately sifted through recipe books and online searching for something that came close to what I thought a pecan pie should taste like. My dad’s recipe is good, but bit sweet for me. Never finding one, I created my own, adapting from my dad’s and Epicurious, and it has now become one of my specialties. A few notes about the crust: 1. My new goal in life is to make perfect pie crust using only a food processor, so this recipe will have you use a food processor. I know how to do it by hand, but like I said, I’ve decided this is my new goal. If you would prefer, please feel free to use a pastry knife or fork. 2. I’m determined to make perfect pie crust using only butter. This has been close to impossible for me so far. Shortening truly does add to the flakiness of the crust, but it is evil, so my crusade continues. Slowly. 3. I make the ugliest pies in the universe. The solution? I’ve started making pies in a spring-form pan. It’s clean, it’s modern, no fuss no muss and you don’t have to worry about leaving your pie pan at someone else’s house. In the bowl of a food processor, combine flour, salt, and sugar. Add butter and shortening, and pulse until the mixture resembles coarse meal, 8 to 10 seconds. While pulsing the machine, add ice water in a slow, steady stream through feed tube. [Personally I like to open the l id, pour a little water on top so there is one small thin layer, then I replace the cover and pulse. (your call)] Pulse until dough holds together without being wet or sticky; be careful not to process more than 30 seconds. To test, squeeze a small amount together: If it is crumbly, add more ice water, 1 tablespoon at a time. Divide dough into two equal balls. Flatten each ball into a disc and wrap in plastic. Transfer to the refrigerator and chill at least 1 hour. Dough may be stored, frozen, up to 1 month. Roll out dough on a lightly floured surface with a lightly floured rolling pin into a 12-inch round and fit into a 9-inch spring-form pan or pie plate. Trim edge, leaving a 1/2-inch overhang. Fold overhang under and lightly press against rim of spring-form pan or pie plate. Lightly prick bottom all over with a fork if using a pie plate. Chill until firm, at least 30 minutes (or freeze 10 minutes). Note: A foodie friend of mine told me that the pies should only be baked in a tin pan and not glass. I’ve been too lazy to “google” to prove him wrong, so I’m going to take his word for it. Meanwhile, melt butter in a small heavy saucepan over medium heat. Add brown sugar, whisking until relatively smooth. It may look a bit clumpy and may stick to your whisk, but the syrup will smooth everything out. Remove from heat and whisk in corn syrup, vanilla, zest, and salt. Lightly beat eggs in a medium bowl, then whisk in corn syrup mixture. Put pecans in pie shell and pour corn syrup mixture evenly over them. Note: If you have the extra time, pour the corn syrup mixture in the pan first and then lay the pecans out in concentric circles. It takes a few extra minutes, but it makes a pretty pie. Bake on hot baking sheet until filling is set, 50 minutes to 1 hour. Cool completely.